Types of Facial Fillers: Which is Best For You? Just as each person ages in their own unique way, so do fillers provide a custom-made solution for wrinkles and creases in the face. Read on to learn more about the various types of fillers being used today, and how they can help you look more youthful. Bellafill® is made from an acrylic-like microsphere called PMMA, or Polymethyl Methacrylate suspended in collagen gel. The solution is injected into areas such as nasolabial folds around the mouth ("smile lines"), to fill in pit-like acne scars, to plump lips, and to reduce facial wrinkles. 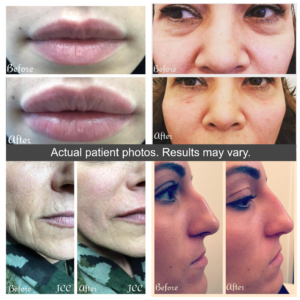 What’s unique about this filler is that it not only offers instant volume, it also promotes the body’s formation of new collagen in the treated areas (volume that continues to build over time). It lasts about 5 years. Prefer to watch a video instead? View our expert guide to facial fillers video below and be sure to subscribe to our YouTube channel. HA fillers are the most common type of filler on the market right now. HA is a naturally-occurring sugar (carbohydrate) in the skin. It is plentiful in young skin, and helps to bind water to the skin, giving it a supple appearance. Lips are one of the most-injected areas where HA fillers are used. Lip injections can treat the Philtrum (area between the nostrils and upper lip), Cupid's Bow, Vermillion border, oral commissure, vertical lip lines ("lipstick lines"), and to provide volume in the upper and lower lips. This type of filler can also address a variety of other age-related concerns such as nasolabial folds, marionette lines on the sides of the mouth, pigmentation, dark circles under the eyes, and forehead creases. Lasts about 6-12 months. Belotero® is made of HA, or hyaluronic acid, a compound that naturally occurs in the skin. HA fillers like this provide a more restored, refreshed look by adding volume to sagging or wrinkled skin, filling in lips, and rehydrating the treated areas by attracting water molecules to the deep layers of the skin. This substance is also ideal for nasolabial folds (“laugh lines”), the back of the hands, and (off-label use) on the area between the chin and chest. Lasts between 6-12 months. JUVEDERM XC® is unique in that is made of HA, and it is designed especially for around the mouth to last for up to one full year. This product boasts advanced VYCROSS technology (varying HA molecular weights) so that it is microfine, injects with ease, and feels smooth. JUVEDERM ULTRA® is also made of hyaluronic acid, but offers the added benefit of lidocaine for more comfortable injection. Also dubbed “local anesthetic,” this numbing effect helps make treatment a breeze for plumping the lips and filling in creases around the mouth and nose. If you are looking for crow’s feet treatment around the eyes, this is not the right choice because the solution spreads a bit more once injected. Lasts between 6-12 months. RADIESSE® is great option for adding volume to cheeks and temples, filling in folds around the nose and mouth, or for jaw contouring. It lasts about one year and contains two components: a water-like gel matrix and calcium beads (Calcium Hydroxylapatite microbeads). The most appealing feature of RADIESSE is that the calcium beads cause the body to produce collagen in the treated areas. If you are looking to plump your lips, this injectable is not for you – its consistency is not flexible enough for use in this area. Lasts for 1 year or longer. Sculptra® is made from Poly-L-Lactic Acid (PLLA) and is used to restore facial volume and to address shallow to deep wrinkles and nasolabial folds. Lasts up to 2 years. Collagen fillers are ideal for filling scars caused by acne, surgery, or injury. They can also be used in the correction of superficial wrinkles and in the deep dermal tissue for facial contour irregularities. Lasts about 3 months. Visit our services page to read about each individual product and how it can benefit you. Ready for a free consultation and to get your first treatment with James Christian Sardelli, RPA-C? With over a decade of experience providing beautiful results for clientele in the New York and Long Island areas, give him a call today at (917) 860-3113. We have locations in West Sayville, Commack, Manhattan, Westhampton Beach, Farmingdale, Islip, Huntington, and Rockville Centre. Bellafill® : Registered trademark of Suneva Medical, Inc.
JUVÉDERM® : Reg. trademark of Allergan, Inc.
RADIESSE® & Belotero® : Reg. trademarks of Merz North America, Inc.
Restylane® & Sculptra® Aesthetic : Reg. trademarks of Galderma Laboratories, L.P.
What is a Liquid Facelift and How Can it Transform My Look?